Fennel and Cabbage Slaw Recipe from Oh My Veggies! It wasn’t until I started making slaw myself that I began to understand its merit. I never could get on board with mayo-drenched cabbage, but tossing fresh in-season vegetables together with zesty dressing makes for a flavorful, healthful slaw that is utterly addicting. As in I’m-eating-slaw-for-dinner, back-away-from-my-slaw, #slawfordays, I-can’t-get-no-slawtisfaction, we’re-getting-slawshed sort of addicting. I’m just going to call a spade a spade: this slaw made me want to date myself. As in pat-myself-on-the-back, dang-I-look-good, who’s-that-lady, wine-and-dine-me date myself. I loved how simple yet flavorful and refreshing the recipe turned out to be and was too busy eating it by the forkful to bother putting it on anything. I used Greek yogurt in place of mayonnaise, which gave the slaw a nice creamy tang and kept it light. If you’re new to fennel, no need to be scared! Fennel is a spring vegetable (so get it while the gettin’s good!) with a very unique flavor. Both the fennel bulb and seeds have a peppery, anise-like taste, which is delicious in soups, salads, slaw, and stir fry. 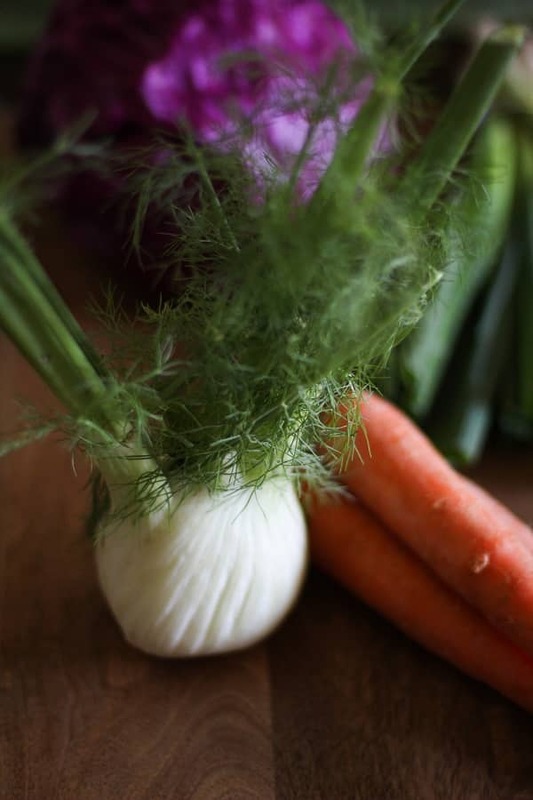 When you buy fennel, look for a bulb that is firm and very white. Fennel bulbs begin to turn brown as they get older, and while they are still very usable in this state, the freshest bulbs are the hard, white ones. Because fennel is so firm, I like to slice the bulb very thinly when I use it in salads. When fennel is cooked in soup or stir fry, it has a similar consistency to onion and gives a wonderful depth of flavor to a dish. 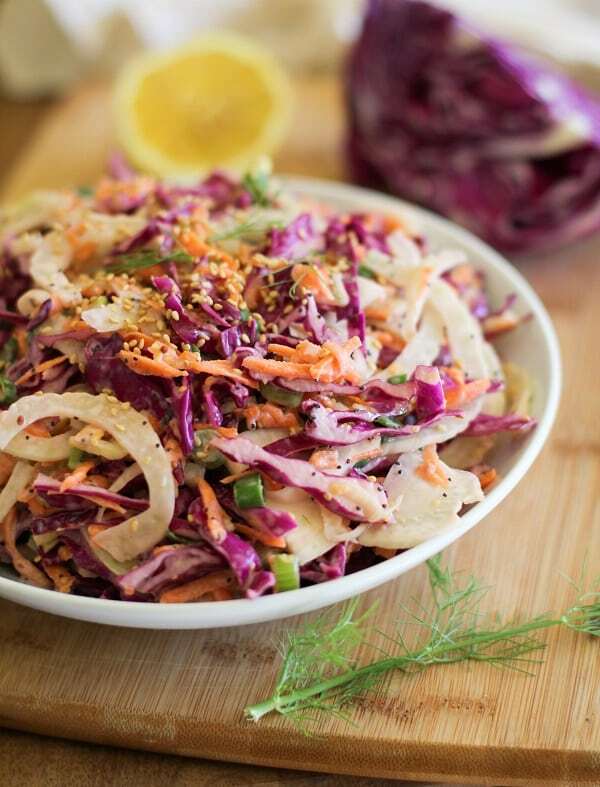 Fennel slaw is the perfect accompaniment to your springtime meals. It’s full of vibrant spring vegetables with tasty dressing and funky fun sesame and poppy seeds. And no mayonnaise! It adds flavor and texture to your burgers, sandwiches, and tacos. But if like me, you have not the patience to actually prepare food upon which to place the slaw, the fork-to-mouth approach works just dandy too. Now get thee a fennel bulb and no-mayo yourself some slaw! A light, refreshing springtime slaw made with fresh fennel. Toss the cabbage, carrots, fennel, and green onions in a large bowl. In a small bowl, whisk together the remaining ingredients to make a dressing for the slaw. Pour the dressing over the veggies and mix well. Serve on your favorite veggie burger, sandwich, or taco, or alongside your favorite main dish. Julia I love this slaw. The fennel is such a wonderful addition. The crunch and creaminess of this sound fantastic!!! Thanks, Andrea! If you and Taylor grow fennel on the farm, you should definitely uproot one and give this recipe a go! Hope you had an excellent weekend! So much yumtasticness is one bowl! Loving all the colorful veggies and the creamy yogurt sauce all mixed up with the little seedies. Spring has sprunnnggg! Thanks, Anne! I just love how vibrant the colors are – definitely a cheerful slaw for coming out of the long winter months. So glad you’re a fellow fennel-lover! I’m definitely super iffy on fennel and it’s licorice-y flavor, but I can’t walk away from a mayo-free slaw!! They are just way too few and far between. Yeah, I can see how fennel isn’t for everyone. You could just add some extra cabbage to the recipe and take out the fennel altogether if you’d like 😀 It’d still be great! Hi this looks wonderful- what I use instead of yogurt to make this dairy free? Thank you so much for your advice- I am new to this vegan cooking thing and I appreciate your wonderful blog! I found this over on foodgawker while looking for a recipe to use up the extra fennel I had sitting in my refrigerator. What an absolute delight this slaw was! I paired with with a Dutch fennel gratin and it was perfect. The yogurt sauce perfectly complimented the tartness of the fennel and lemon. Yums! Yaaaay! So happy you made and enjoyed it, Rae! It really is such a flavorful and healthful slaw. Definitely perfect for this time of year! I’m going to a BBQ this weekend and am thinking I’ll have to make another batch of this to share with my friends 😀 Thanks for stopping by and for your feedback! I used kohlrabi instead of fennel (using what the garden gave! ), and a shallot instead of green onions. It turned out beautifully! Super fresh. I love that yogurt/mustard/lemon dressing so much I could drink it through a straw on its own. Yum!